Tucson is the Old Pueblo, drenched in sunshine and steeped in history and culture. It is actually one of the sunniest cities in the US, set in a cacti-studded desert in the 500-square-mile Santa Cruz River Valley in southern Arizona, surrounded by mountains. It is also the largest city in the southern part of the state, and the second largest in Arizona, with a population of over 520,000. From Phoenix, it is approximately 100 miles directly south, and from Nogales, the city on the US-Mexico border, just 50 miles or so to the north. Among other communities of interest in the area are Tubac, Patagonia, Sonoita, Sierra Vista and Tombstone, as well as a couple of prominent Indian reservations. 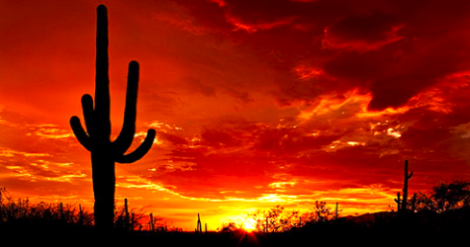 Tucson, most notably, is the home of the giant saguaro cactus, the world’s best-known, most distinguishable cactus, which grows happily in cacti forests in the adjacent Saguaro National Park. In fact, several golf courses in the Tucson area are dotted with the saguaro cactus. Like other parts of Arizona, Tucson, too, is abundant in outdoor possibilities, including hiking, biking, rock climbing, hot-air ballooning, horseback riding, even snow skiing in winter on nearby Mt Lemmon, and golf, of course, with more than a dozen courses to choose from. Tucson is also a city of culture, with distinct influences of Native American, Spanish, Mexican and early Western. There are sights, sites, structures, museums and cultural centers to remind one of these. In addition, the city has good galleries, performing arts venues, and culinary experiences in the offing. Tucson can be reached on Interstate 10 from both Phoenix in the north and New Mexico which adjoins to its east. The city also has an airport, Tucson International Airport, which is served by major carriers that offer non- stop flights to and from several US cities as well as Mexico.